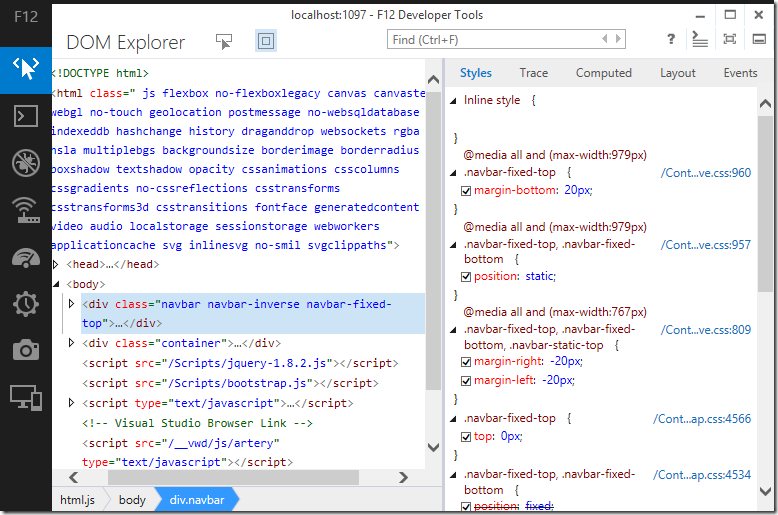 The Windows 8.1 preview includes a preview of Internet Explorer 11, which includes a new version of the F12 Developer Tools for inspecting, profiling, and debugging web sites. The developer tools are now metrofied with flat buttons and an emphasis on content over window chrome. Although there are still a considerable number of icons and commands to press, it does seem easier to read and work with the information presented. All the important features are still here, though a few things seem to be missing (the ruler tool and link report as two examples), and they still behave the same and present the same information. Update - yes, the DOM explorer tracks changes in real time now. Huge improvement! 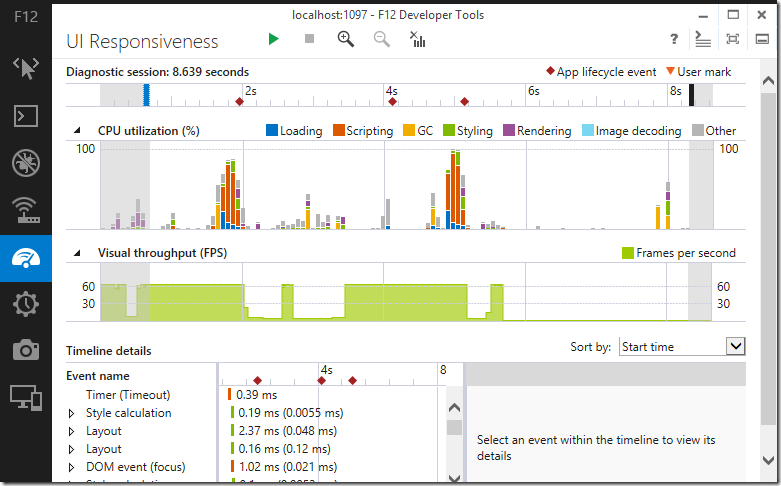 The emphasis is on performance with new “UI Responsiveness”, “Profiler”, and “Memory” sections. The Memory tab is looking very useful for today’s apps and the heap snapshots are easier to use compared to the tools in other browsers. Likewise the code profiler is easy to work with and similar to the profiling tools for managed code in VS Ultimate. The “UI Responsiveness” tab is visually appealing and highly interactive but contains an enormous amount of information and will require some guidance and practice to use properly. 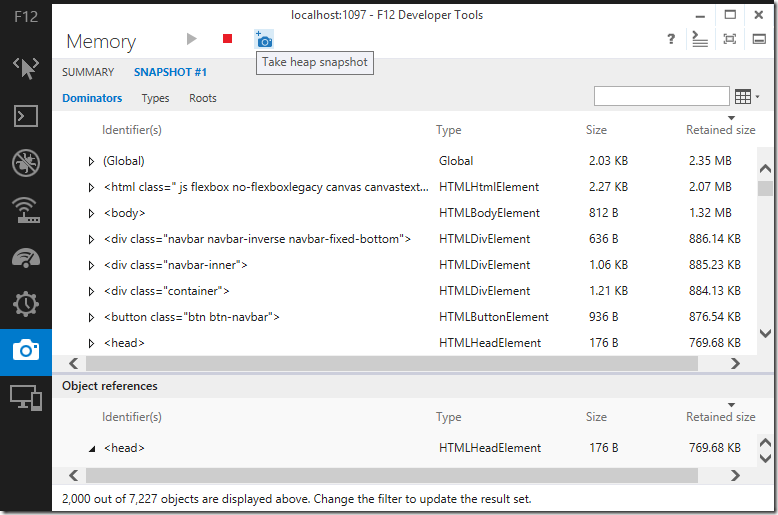 To get a full picture of what is happening on any given page, the IE dev tools will need to give us the ability to inspect local storage, session storage, IndexDB, and Application Cache. I didn’t find any of these in the current release. Yeah, I'm very glad to see many of the changes added to the DevTools and that they have been rewritten from scratch. I would also like to see ways to manage storage as you mentioned. My hope is that somehow the DevTools can be updated out-of-band from the main IE, but only time will tell. Extensibility would also be nice, but I haven't heard one way or another about that. Great write up! I love the new looks, but without the missing features is going to be hard to adopt the IE F12 tools for day-to-day work. That being said, I am glad this tools are now part of the browser in Windows RT, they are huge upgrade over their predecessor. Glad to read about these improvements. I'm trying to get the preview installed but having a bit of a problem with my Dell laptop. Anyway I do have a burning question: Does the DOM view update in realtime now? That is, if AJAX calls are made or carousels slide, does the DOM window display those elements and (I'm assuming everyone is using jQuery these days) the element style attributes update accordingly? @Carl: Yes, the DOM Explorer is real time now, which is a huge improvement. I'm used to seeing this work in other tools so I didn't think about it when I saw it in IE11 - so thanks for pointing that out! Great news, Scott. Thanks for indulging my curiosity. It is great news. We expect more from Microsoft when the preview version of IE get lunched, but when the final product comes to the market, all is a buggy browser. But looking forward to check all these new improvements.